For a girl forever bawking about eating what’s in season, you might think what I’m about to share with you is a little out of whack. Originally, like everyone else, I thought this would be a good topic for later in summer when tomatoes are front and center. But recently, while writing this for A Little Bit of Spain in Iowa, it struck me that now actually is the perfect time to talk about putting up tomatoes. I’m not kidding. Now is the time to start planning what you’re going to grow in your garden and/or how much preserving you need to do to fill your pantry with the basics you’ll need for the following 12 months. If I wait to talk about it until you’re drowning in tomatoes, I’ll be too late to be much help. Over the years, I’ve pared down my pantry needs to actual needs rather than whimsical wants. 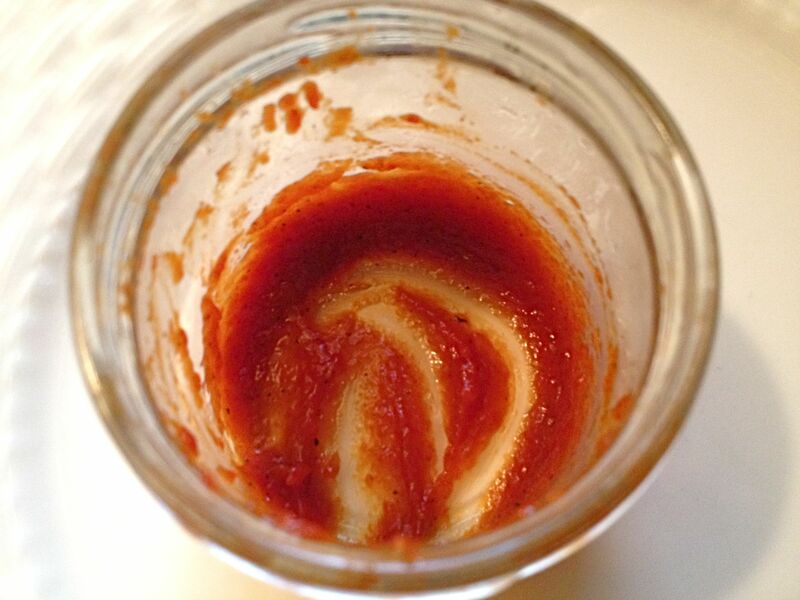 I used to can cooked sauce, whole tomatoes and other more specific items like salsa or ketchup. Each pantry item involved a sweaty day in the kitchen and its own set of ingredients & procedures. Now don’t get me wrong; I actually love that sweaty day spent in the kitchen. 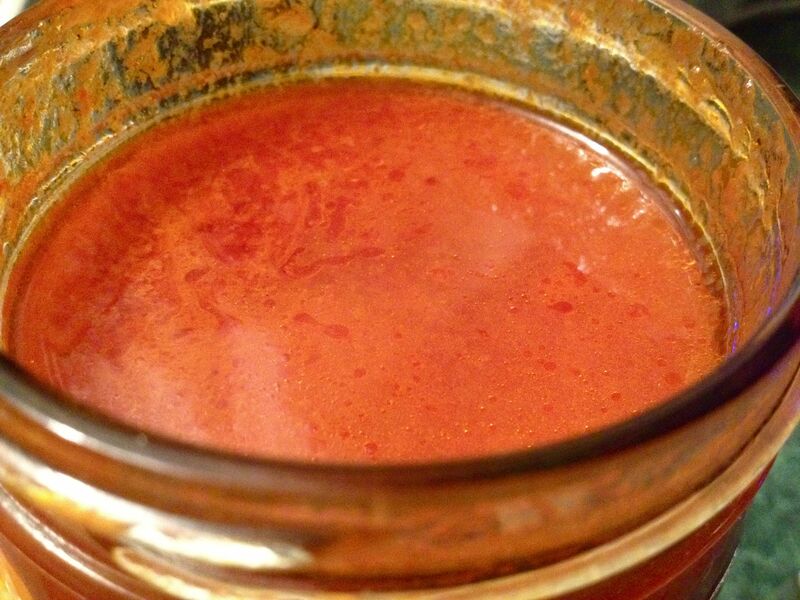 But today, I prefer one multi-purpose workhorse item like this versatile recipe for tomato passata, rather than several specific items like different sauces & salsa. Seasoned as little as possible to let the flavor of the ingredient shine and for greatest kitchen versatility later. Useful in a variety of ways and with little meal-time fussery. I still want to be able to cook super-fast from jars and cans – you know, the American way. I just want my jars and cans to be ones I filled myself with ingredients I feel good about. A flexible preserving process. I often interrupt in the middle if necessary, break things up into 2 sessions and/or scale it up. I need a recipe that’s not too persnickety. 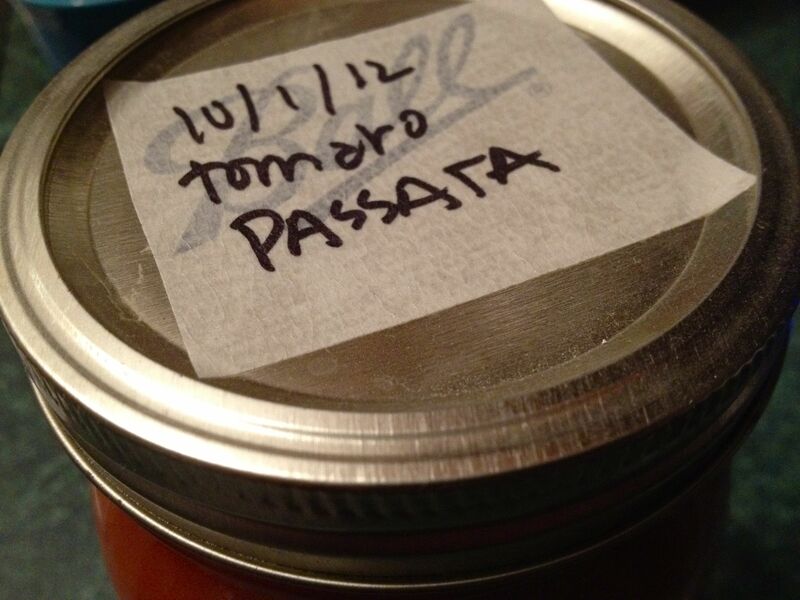 Tomato passata is a recipe from my tattered and stained favorite River Cottage Handbook #2; Preserves. The author, Pam Corbin, makes passata to use as a base for all sorts of soups, stews and curries. Check it out here. 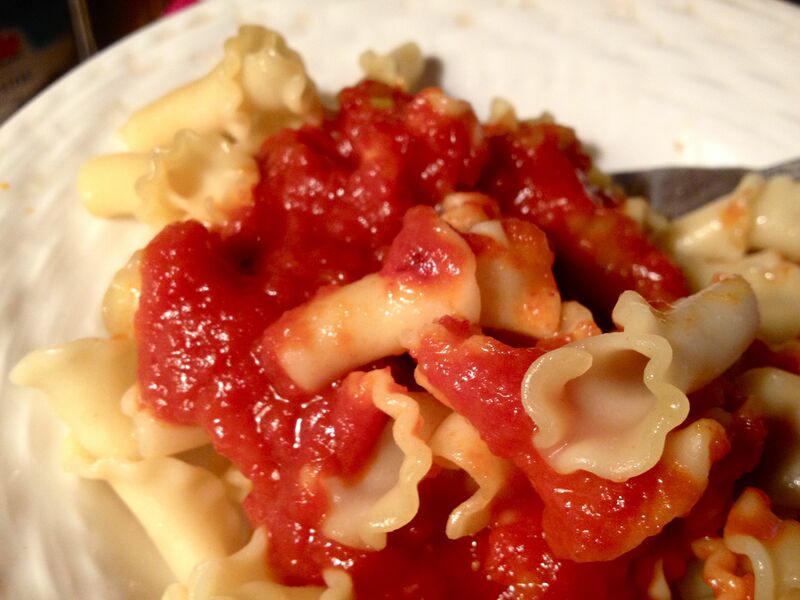 Quick top-shelf pasta/pizza sauce, no recipe required. Simply open the jar, put in a saucepan and simmer gently until reduced by half. 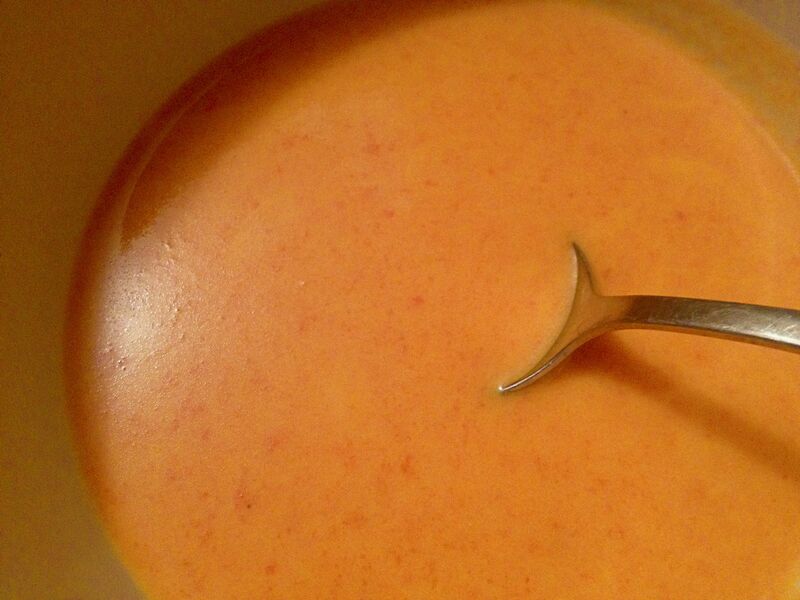 My favorite home-made cream of tomato soup in a jif – puts that red & white can to shame. 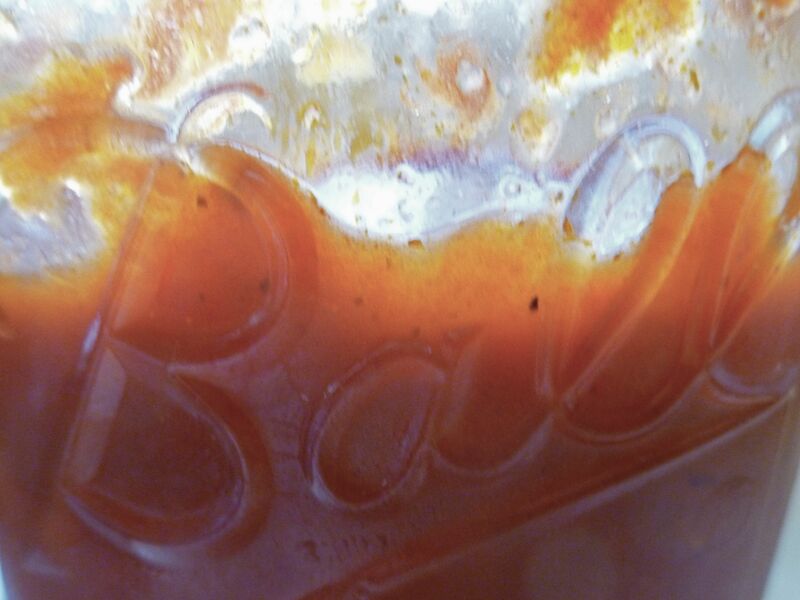 A fast-forwarded version of the best home-made ketchup ever. The beauty of making my ketchup from passata is that I can do it later in the season when the kitchen’s not so hot and I don’t have so many other pressing projects competing for my time. Plus, I’ve already done half the work, so it hardly takes any time at all. Being the heirloom/heritage breed type, I grow my own, so it’s time to order your seeds to be sure to get the varieties you want and be sure to get the seeds started on time. How many plants will I need to make enough passata for the year? I use about one quart of passata every two weeks, so I’ll need about 26 quarts. Each quart uses approximately 4 ½ pounds of fresh tomatoes, and a good heirloom variety tomato plant in Pennsylvania can yield approximately 9 pounds give or take. There will be some fudgery at first since everyone’s experience will vary, but this is a good place to start. 26 (quarts of passata) x 4.5 (pounds of tomatoes needed for 1 quart) = 117 pounds of tomatoes. 117 (pounds of tomatoes) ÷ 9 (estimated pounds yielded per plant in my area) = 13 plants. Now, calculate the same way for your canned whole tomato needs then round-up to be sure to have plenty of fresh eating tomatoes and for sharing with your non-gardening friends. I like to have at least 20 plants minimum for my two person household, though I’ve been known to attempt as many as 40. Now, maybe the growing part is not for you, and I’m not here to tell you any different, although I admit I wish you’d consider it. Farmer’s markets are full of farmers growing all sorts of heirlooms and organics. If you belong to a CSA you probably get swamped with tomatoes in the summer, or maybe you have a great grocery selling locally grown produce. No? Well, you can fix that by finding a local grower here. Okay, you have no excuse for not at least trying this once, even if just to say you did. I’m pretty confident once you get spoiled with a home-made pantry, you won’t want to go back to store-bought ever again. What’s your favorite tomato workhorse? I’m planning my first Spring garden. I’m looking forward to trying the passata. Thank you for the post. Thank you Sandra for the visit. Good luck with that garden! This sounds great! I have a friend who does this and freezes her roasted tomatoes. Not sure if she purees them, but her family loves them! I will have to keep this in mind for this summer. Thanks for posting! Thanks for the visit. I froze some and canned the rest. In the canned quarts, I needed to add 2 TBS prepared lemon juice to each quart to adjust the pH. It affected the uncooked flavor a bit, but once cooked you’d never know the difference. I’m sure it’s just as good chunky… no special equipment needed… the food mill does skin & seed the tomatoes though if that matters to you. 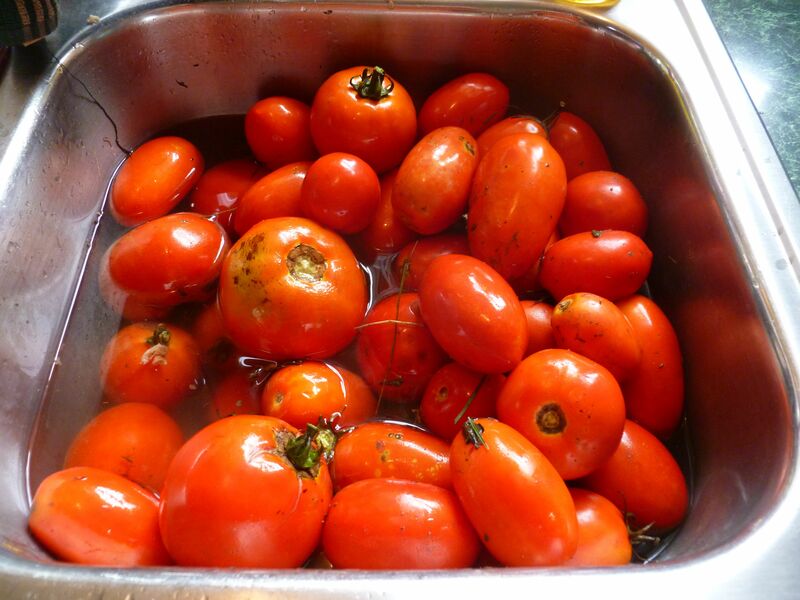 I had a ton of tomatoes last fall…..I make a “sort of” spagettii sauce or stewed tomatoes and canned it. I use it in everything from soup and stew to pasta. Veroma’s are my mainstay and we have a greenhouse that’s not far off that I can by the best beefsteak tomatoes at for a reasonable price…….sometimes makes me wonder why a even bother to grow them as they don’t do that well. I had some Ox Heart seeds that I liked but can’t find them anymore. Some things I don’t even bother thinking about growing. If I truly dislike working with something, I don’t force it anymore and feel no guilt about buying from someone else. I love the look of your passata! And I really love your way of thinking backing into the number of plants to feed your habit. I use the same River Cottage recipe, though I don’t make the same quantities as you. In the UK we don’t can and bottle to the same extent as overseas and most of my tomatoes go into the freezer. I froze half of mine – this year that’s exactly what I did – I froze more stuff than I canned. I love that book – it may be my very favorite. I got on the tomato wagon last summer. I’d canned extra tomatoes from summer before but never tried to have enough for winter. I put up some 250 lbs of tomatoes. I was just sure that we would still run out. But I think our stores will hold. I like the idea of your passata. I work with a CSA that does pizzas in a brick oven on Fridays during the summer. They put up some of their own tomatoes and simply use crushed unseasoned tomatoes for the sauce. This year I helped them and batched maybe 70 quarts for them. Our deal was for every six quarts made I got to keep one. So I also got a bunch of crushed tomatoes which have come in very handy for soups and stews. They were my passata this year. As for the next growing season? I adored the Barbera Kingsolver Tomato Sauce that she makes in Animal Vegetable Miracle and plan on making way more of than six quarts next year! I will also be adding passata to the list! And you are right, this is the time to plan and be ambitious dreaming under a thick blanket of snow. That sounds like some pretty ambitious canning Foy Spicer. I always feel that way too and it takes me a while to loosen up and start cracking the jars. I have a bit of an early season hoarding problem, lol. 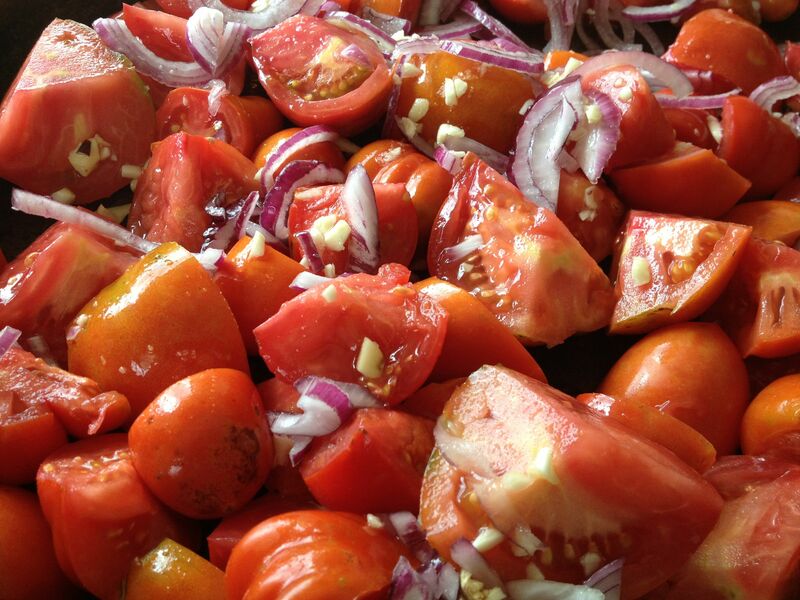 What tomato varieties do you like to use for this? I live in Minnesota, so our season is super short. I need a workhorse tomato variety! I don’t know how my area would compare to Minnesota – I think things may be a little more forgiving here. I grew a variety of heirlooms last year; Carmello, Milano-Plum, Brandywine & Costoluto Genovese. The mixture was a good one, but I think many others would be just as good or even better. This is such a tough time of year, just waiting for spring to begin. I love this practical advice about planning, your recipes look great too. If it would be alright, can I reblog this? I’m glad you liked this one. You’re welcome to reblog, but please include proper attribution. And thanks very much for asking! Read through some of your blog and enjoyed it very much. Good luck with your adventures! While looking for some ideas for canned beets, I came across this article from Auburn Meadow Farm. In its paragraphs I found a way to calm the anxiety and take real steps towards an organized and productive garden. While we mostly talk about poultry, this post from Auburn Meadow Farm addresses our runner-up favorite food…heirloom tomatoes…enjoy! You must be farther north! Here in Indiana (zone 6a) we have been frost free for week and the tomatoes are in the ground. I like to do my Plan to Preserve in January when I’m ordering seeds. Although this year we put in our first vegetable bed in the new house so we are behind right out of the gate! It’s always something, right? My favorite tomato work horses are the San Marzano and Defiance. And I like to make a simple crushed tomato as my basic preserve. Of course we also do salsa, spaghetti sauce, pizza sauce and enchilada sauce, but the go to is just a simple crushed tomato. 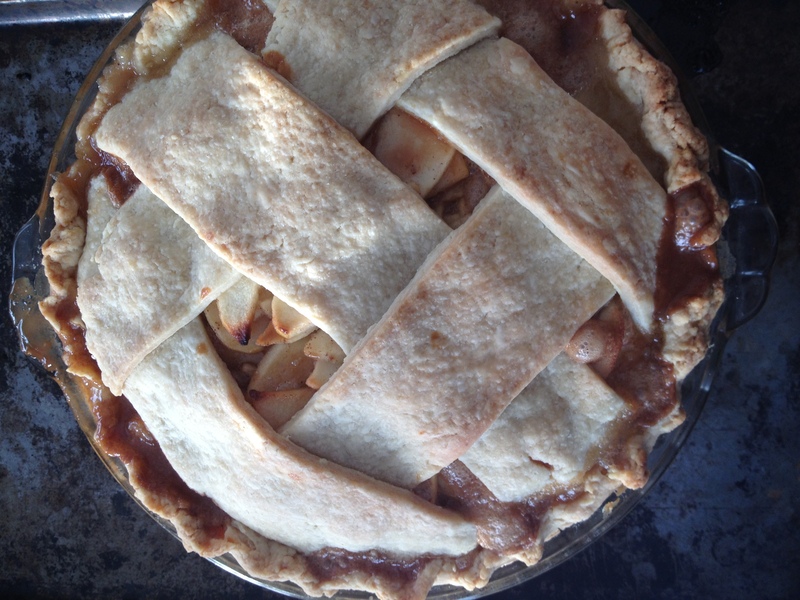 Tammy Kimbler (@Onetomato_two) I live in South Dakota and love Amish Paste for canning. They’re meaty enough for canning but juicy enough for fresh eating, and they’re bigger than standard paste tomatoes like San Marzano. Golden tomatoes make beautiful sauces, too. Just add a tablespoon of cider vinegar to each quart to pump up the acidity.